benefitting the Quakertown-area food programs the church supports. ages 5-12 and free for children under 5. Diners may pay at the door and takeout will be available. Fishes” - ventures in which St. John’s participates. the event has been postponed to Feb. 9. St. John’s will host an afternoon of family fun Dec. 8 from 1 to 4 p.m., featuring a “Little Shoppers Shoppe,” craft stations, and light refreshments. The event, free and open to the public, is geared towards children of all ages. A variety of stations to create Christmas ornaments and other holiday items will be staffed with helpers, and light refreshments will be served. A “Little Shoppers Shoppe” will offer a variety of inexpensive gifts for family and friends, with free wrapping included. St. John’s annual Pork & Sauerkraut Dinner, with all the trimmings, will be held Saturday, Nov. 10 at the church. Dinner will be served from 4 to 7 p.m. and will include pork, sauerkraut, mashed potatoes, string beans, applesauce, dinner rolls, homemade desserts, coffee, tea and iced tea. Takeout will be available. Cost of the dinner is $12; $5 for children 7 to 12; free for those 6 and under. Diners may pay at the door. Proceeds from the Pork & Sauerkraut Dinner will be used to refurbish the church’s stained glass windows. A Family Fun Bingo event will be held April 7 in Spinnerstown to benefit Help Hope Live, a national nonprofit organization that is helping to raise funds for St. John’s congregation member Gary Small, who is need of a lung transplant. Proceeds from the event, to be held at 4 p.m. at St. John’s Evangelical Lutheran Church of Spinnerstown, 1565 Sleepy Hollow Road, Spinnerstown (GPS, Quakertown 18951), will go to the organization’s Mid-Atlantic Lung Transplant Fund, which assists lung transplant clients with financial and other resources. Gary has Interstitial Lung Disease and is on the lung transplant list at Temple University Hospital in Philadelphia. An Air Force veteran who served in Vietnam, Gary is a Pennsylvania forest fire warden and, for more than 25 years, was active with the Springtown Volunteer Fire Co. For nearly 46 years, he has worked for Carson Helicopters, Inc. of Perkasie and, in that capacity, earned a credit in the 1980 movie “The Blues Brothers” as part of the helicopter crew that dropped a Ford Pinto car onto a Chicago street. Gary is married and the father of a son and two stepsons. He and his wife, Diane, have seven grandchildren. Family Fun Bingo is being organized by church member Giacinta Barndt, a junior at Quakertown Community High School, as a National Honor Society project. Doors will open at 3 p.m. for the event which will include a basket raffle, silent auction, 50/50, bake sale and light refreshments. If purchased in advance, tickets are $20 for 20 games, with two cards for each game. Price at the door is $25 for 20 games, which also includes two cards. Extra cards are two for $5. “Specials” are one for $5; three for $10. To pre-purchase tickets, contact Giacinta at 267-772-9500 or send an e-mail to stjohnsspinnerstown@gmail.com. Direct donations to the transplant fund may be made at www.bit.ly/garysmall. The site gives additional information about Gary. St. John’s will host a pot pie dinner Saturday, Feb. 3 from 4 to 7 p.m., with proceeds benefitting the Quakertown-area food programs the church supports. The dinner menu includes a selection of either crusted chicken pot pie or chicken “bott boi,” coleslaw, corn, rolls and butter, assorted homemade desserts and hot and cold beverages. Cost is $8 for adults; $5 for children ages 5-12 and free for children under 5. Diners may pay at the door and take out will be available. Proceeds will benefit the “Backpack for Pumas” weekend food project at Pfaff Elementary School, located just down the road from the church, and two dinner programs for financially disadvantaged individuals and families - “Food for Friends,” and “Loaves and Fishes” - ventures in which St. John’s participates. In case of inclement weather, call the church at 215-536-0734 or visit this site to see if the event has been postponed to Feb. 10. St. John’s will host an afternoon of family fun Dec. 9 from 1 to 4 p.m., featuring a “Little Shoppers Shoppe,” craft stations, and light refreshments. More than 150 diners packed Fellowship Hall Nov. 11 to feast on the offerings at St. John’s annual Pork & Sauerkraut Dinner. Complementing the main course were creamy mashed potatoes, green beans, applesauce, rolls and butter and an endless array of homemade desserts, courtesy of St. John’s bakers. The dinner was made possible through the efforts of dozens of volunteers from the church who spent hours shopping, cooking, baking, slicing, serving, prepping and cleaning up. Proceeds from the event will be used for restoration of the church’s historic stained glass windows. More than 100 bluegrass fans and strawberry lovers filled St. John’s multipurpose room June 17 when gloomy skies and rain showers shifted the Bluegrass & Strawberry Festival from the church’s grove to the indoor venue. Members of the Fellowship Committee and the Willing Workers service group, which collaborated on the event, scrambled that morning to revise plans to accommodate all activities from noon to 5 p.m. indoors. Four bands -“Big Valley Bluegrass,” “Cat Elwell and Saucony Grass,” “Mason Dixon Bandits,” and “Without A Paddle” - performed, and concert-goers eagerly partook of the food offerings, including turkey barbeque, hotdogs and luscious strawberry desserts. Two dozen beautifully-wrapped themed baskets and individual items, plus three door prizes, fetched hundreds of raffle tickets, and two tables of baked goods, prepared by congregation members, all were sold. As is typical of St. John’s, dozens of volunteers came together to present an enjoyable event for the community, despite the last minute changes. Many thanks to everyone who helped with set-up and clean-up, prepared more than 50 lbs. of barbeque, procured strawberries, ice cream, cake, soft drinks, chips, paper goods and other assorted items, to those who sliced strawberries, baked, served food, sold tickets, worked as cashiers, and donated items for and arranged the raffle baskets. Special thanks to the Hinderliter family which provided the hotdogs and to Virginia Gerlach who arranged for the bands and performed as well. And thank you, too, to all who attended and made the festival such a success. Fellowship Committee Chairman Randy Felten reports that two guests (who had never been to St. John’s), each gave a donation, citing the beauty of the church and gratitude for the work it took to host such a delightful event. St. John’s will host a pot pie dinner Feb. 4 from 4 to 7 p.m., with proceeds benefitting Quakertown-area food programs the church supports. 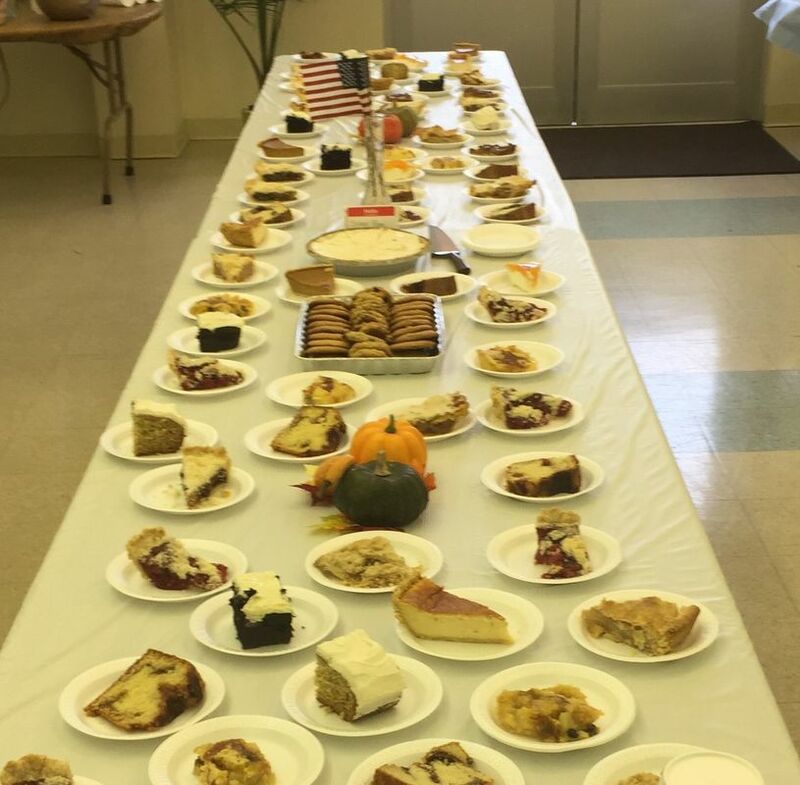 The dinner, to be held in the church’s multi-purpose room, will include crusted pot pie, corn, coleslaw, rolls and butter, assorted homemade desserts and hot and cold beverages. Cost is $7 for adults; $4 for children ages 5-12 and free for children under 5. Diners may pay at the door. Proceeds will benefit the “Backpack for Pumas” weekend food project at Pfaff Elementary School, down the road from the church, and two dinner programs for financially disadvantaged individuals and families, “Food for Friends,” and “Loaves and Fishes,” ventures in which St. John’s participates. Snow date for the dinner is Feb. 11. In case of inclement weather, check this site or call the church at 215-536-0734 to see if the event has been postponed. St. John’s multi-purpose room was bustling with activity Nov. 19 when the church’s Willing Workers group hosted an afternoon of Christmas family fun that included half-a-dozen holiday craft stations for children of all ages, a “Little Shoppers Shop”, and homemade treats. The free, two-hour event drew more than 65 children and adults and was staffed by some 20 volunteers. The children created Christmas ornaments and other holiday items and shopped for family and friends from a wide variety of $1 items, with gift-wrapping provided. St. John’s bakers prepared dozens of cookies and treats to go with complimentary cocoa. Event-goers also could purchase tickets for a raffle of holiday-themed items. Winners were selected after the church’s Nov. 20 worship service. Also available for purchase were boxes of “buckeye” candy, toy-shaped clear lollipops made by members of the Willing Workers, and decorative jars of dry soup, brownie and cookie mixes. Special thanks to Ruth Ann Barndt and family for organizing the “Little Shoppers Shop,” and raffle. St. John’s is inviting the community to experience the music of the Valley Choral Society at a free concert Sept. 11 at 1 p.m. in the church’s renovated sanctuary. The sanctuary upgrades, which include air conditioning, new carpeting, paint and lighting, pew pads and the sandblasting and hand painting of the 100 +-year-old stamped tin ceiling, will be unveiled to the congregation that day at the 9:45 a.m. worship service. The Valley Choral Society, under the direction of artistic director and conductor Patricia Conrad of Pennsburg, will pay tribute to those who lost their lives in the Sept. 11, 2001 terroristic attacks with some patriotic selections. Also included in the group’s repertoire will be spirituals and music from the ‘40s. Piano accompanist will be Andrew Long of Perkasie, also the Society’s assistant director. Refreshments will be served following the hour-long concert. There is no admission fee for the concert, but free will offerings will be accepted. The Valley Choral Society, whose members are from Montgomery, Bucks, Berks, and Lehigh counties, performs music of all styles and genres. It has appeared at Longwood Gardens in Kennett Square, the Pennsylvania State Capitol, as part of a concert series at St. Francis Xavier Church in Philadelphia and for the Reading Express, the Philadelphia Phillies, and the Lehigh Valley Iron Pigs. In 2014, the choral sang at the National Presbyterian Church in Washington, D.C. and in 2007, traveled on a goodwill concert tour to Germany, Austria, and the Czech Republic. Bluegrass fans and strawberry lovers will come together June 18 when St. John’s hosts a free Bluegrass/Strawberry Festival from noon to 7 p.m. in the “Grove,” across the road from the church. The event, featuring seven bands, includes a bake sale and themed basket raffle. In case of rain, all activities will be held in the church. Guests are invited to bring lawn chairs and picnic blankets. Food, including pulled pork sandwiches, hot dogs, snacks and beverages, will be available for sale, as will strawberry desserts and treats. No alcoholic beverages are permitted. Music will begin at noon with Raven Hill; 1 p.m., Reeve, Coer & Goldberg; 2 p.m., Kelly Planer and the Perks; 3 p.m., Mason Dixon Bandits; 4 p.m., Cat Elwell and Saucony Grass; 5 p.m., Without A Paddle; 6 p.m., Vintage Drive. ​The Mason-Dixon Bandits, which says it “loves harmonies,” plays mostly bluegrass with “a sprinkle of Country and Fifties.” Members include Judy Calvert, John Calvert, and George Deremer. ​Cat Elwell & Saucony Grass is headquartered in Kutztown,. just a stone's throw from the Saucony Creek. Members are: Cat Elwell, leader, fiddle, and vocals; Benjamin Le, rhythm guitar, lead vocals; Michael Kleibscheidel, mandolin; and Don Byrer, upright bass, lead vocals. Bluegrass “barely scratches the surface” of the music it plays, says Kelly Planer and the Perks. “Alt-bluegrass, American Roots Music comes closer,” it says, “yet we prefer to keep our options open.” Members are Dave Coin's, banjo; Kelly Planer, vocals, and Dave Imhof, solid bass. ​A traditional bluegrass band from the Delaware Valley, members of Reeve, Coer and Goldberg met at the Holmesburg Jam in Philadelphia. The band includes Bob Goldberg Becky Coer, Mike Reeve, and Terita Reeve. ​Without A Paddle says it performs “bluegrass with a twist,” a mixture of bluegrass, gospel, swing, and country songs featuring vocal harmonies, including a cappella numbers. ​Members are: Virginia Molinari, vocals, autoharp; Marilla Payne, vocals, mandolin; Denny Schuler, vocals, banjo; Aaron Payne, vocals, bass; and Jon Mattar, guitar. ​Vintage Drive’s song selections, it says, range from “obscure covers” to original compositions, written and arranged by the band, whose members include: Ron Hall, guitar, vocals; Dave Ziler, mandolin, vocals; Carl Baron, banjo, vocals; and Paul Unkert, bass, vocals. The result of its “instrumental prowess and vocal abilities result in a steadfast Bluegrass sound with tight harmonies and creative arrangements, the band says. Also performing June 18 will be Raven Hill Bluegrass, featuring: J.J. Fischer, once a regular at the Wheeling Jamboree with Lila Lou & The Country Boys, with his 5-string banjo; Dan Nace, who spent time with the J.P. Daniels Band, on mandolin; Neal Neuman, who’s been a part of the Philly band “Aimless Pursuit,” on upright bass; Brenda Smith, lead vocals, who says she’s “steeped in South Mountain, Shenandoah Valley bluegrass;” and Pete Smith, tenor and lead vocals, guitar and occasional bass, who says his bluegrass style has been influenced by the “lonesome singing, oft-key sound” of the Stanley Brothers and Charlie Moore. Nine Lutheran colleges and universities from around the country are participating in St. John’s second annual (Lutheran) College Night May 4 from 7 to 9 p.m. at the church. Admission is free and light refreshments will be provided. Representatives will have information about the schools as well as on financial aid and scholarships, some specifically for Lutheran students. Scheduled to participate are Gettysburg College, Gettysburg, PA; Luther College, Decorah, IA; Muhlenberg College, Allentown, PA; Thiel College, Greenville, PA; Newberry College, Newberry, SC; Roanoke College, Salem, VA; Susquehanna University, Selinsgrove, PA.; Wagner College, Staten Island, N. Y.; and Wittenberg University, Springfield, OH. College Night organizers are anticipating a good turnout. News items have been sent to area media, fliers and information have been distributed to 88 Lutheran churches located within a 15-mile radius of St. John’s, and area high school guidance/career counselors have enthusiastically agreed to get the information to their students. Please help spread the word to anyone you know with high school students or pick up a fliers on the table outside the church kitchen and post them wherever possible. St. John’s Evangelism Committee needs everyone’s help to make a May 15 reunion of all those confirmed at the church a success. The committee is seeking anyone confirmed at the church - those who have remained members and those who no longer attend - for special recognition on Pentecost Sunday. All will be recognized during the May 15 worship service and afterwards at a light luncheon for the congregation and guests. Anyone who knows past confirmands who no longer attend St. John’s is asked to invite them to the event and to give their contact information to Becky Felten by e-mail, rebeccasafelten@gmail.com or by phone at 215-529-7436. Give some thought to who was in your confirmation class or, perhaps, your children’s. A sign-up sheet asking for names and contact information for current St. John’s congregants and any family members who were confirmed in the church and want to be recognized May 15 is posted on the bulletin board outside the church kitchen. If you have any questions, feel free to give Becky or Fern Lorish (215-679-7665) a call. ​Willing Workers – The Willing Workers have been busy preparing and selling 140 pounds of chocolate coated coconut cream and peanut butter Easter eggs. Thank you to all who supported this project by purchasing our delicious candy. A special thank you to Monica (Landis) Nace for printing personalized labels for the boxes. We also stuffed and hid plastic eggs for the Sunday School Easter Egg Hunt. All women are invited to join our active service group. For additional information, please contact Peggy Hudock at 215-518-3661 or Ruth Ann Barndt at 267-772-9500 or speak with them after church any Sunday. The next meetings are scheduled April 1, 15, and 29 at 1 PM. St. John’s has raised enough money to fund more than 3,000 meals as part of a food packaging project we are undertaking Oct. 10 with Jerusalem Western Salisbury Church in Allentown. On Oct. 10 from 1 to 4 p.m. at the Allentown church, members of St. John’s will help pack ingredients for protein-rich meals, such as rice and beans or macaroni and cheese, provided by Outreach Inc. Outreach provides meals for those in need throughout the world, but the food packaged in Allentown will be used by area food banks. Volunteers work in teams: 10 people around a station can pack 1,600 meals in an hour. Each meal costs 25 cents and each package contains six meals. The group intends to package 10,000 meals. Fundraising efforts, spearheaded by church member Eli Barndt, a senior at Quakertown High School, have included a pick-prize auction held during the concert and community picnic at St. John’s Sept. 12, and a quilt sale. In addition, the Willing Workers, St. John’s service group which underwrote the purchase of the Amish and locally made quilts, is donating a portion of proceeds from a homemade apple dumpling sale Sept. 25. Many thanks to all who have supported these efforts. As of the Spire deadline, St. John’s had raised enough funds to pay for 3,120 meals, more than it was asked to contribute. Proceeds from the pick-a-prize auction will purchase 1,760 meals; the quilts, 920; apple dumplings (based on orders), 168; and cash donations, 272 meals. Volunteers are still needed for the Oct. 10 packaging event. A carpool will leave from St. John’s. For additional information, call the church at 215-536-0734. Area businesses make auction a success! Some 35 area businesses rallied to support the food packaging project St. John’s is undertaking Oct. 10, supplying goods and services for our pick-a-prize auction whose proceeds will fund 1,760 meals. Please consider patronizing the following businesses and tell them when you do that their generosity to St. John’s of Spinnerstown and the food program is what brought you in. Tosco’s Pub & Grill, Dominick’s Pizza, Karlton Café, Giant, Friendly Book Store, Captain Bob’s Seafood, Dam Good Café, Earl Bowl Lanes, Five Points Bar & Grill, Starbucks, Spinnerstown Hotel, Java Good Day, Bucks County Seafood, Agway of Dublin, Quaker Safety, Sal’s Pizza, Quakertown Women’s Club, Pizza Hut, Indian Ridge Provisions (Hinderliter family), Giovanni’s, and Countryside Homecenter, Inc.
Also, Edible Arrangements, Pepper & Blue Salon & Spa, Unami Winery, Lifeway Christian Stores, Grand Theater, Silver Shear Salon (Cherry Hockman), Classic Hair Design Salon & Spa, Faraco’s Pizza, All Star Kempo Karate, Spors, Friendly’s, Pep Boys, To Your Health, and Richlandtown Inn. Thanks, also, to church members Sara Landis, Mary Slotter, Peg Hudock, the Barndt family, and the Willing Workers for basket contributions. St. John’s “Concert in the Grove,” featuring the Valley Choral Society, and a church picnic Sept. 12, turned out to be the “Concert in the Sanctuary” and an indoor barbecue, but the rain that drove the event inside failed to dampen spirits or lessen the day’s fun and fellowship. With the weather expected to be worse on the rain date the following day, organizers hustled to create an inside event. The Valley Choral Society performed twice between 3 and 7 p.m., filling the church sanctuary with music by the Beatles and choir favorites – and filling the seats. The church’s multipurpose room was filled, as well, before, after, and between the choral society performances, with “picnickers” enjoying hamburgers, hotdogs, chips, ice cream, homemade pie, soft drinks and coffee. The room was alive with activity, including a pick-a-prize auction held to raise funds for the church’s meal packaging event and a sale of items handcrafted by the church’s service group, the Willing Workers. Thanks to all who donated school supplies and backpacks for students at Pfaff Elementary School who may need help purchasing required items. And a special thanks to church council member Becky Hinderliter, center, who coordinated the project. With her are school secretary Barb Chadwick and principal K. Eric Thompson. The congregation donated 10 filled backpacks to the school, St. John’s neighbor on Sleepy Hollow Road. Willing Workers - The Willing Workers have been busy over the dog days of summer. A total of 199 lbs. of potatoes, cantaloupes, apples and plums were donated by the group to the Quakertown Food Pantry. Thank you, Peg Hudock and Ruth Ann Barndt, for picking up and delivering the fruits and vegetables. Possible ideas for future group projects included making peanut brittle, helping out with Code Blue and Operation Christmas Child. In addition, we will be baking pies for the church picnic on September 12th. If you have ideas and are interested in becoming part of the Willing Workers, why not attend a meeting and see for yourself? Our next meeting is Friday, September 11 from 1:00 – 3:00 pm. For more information contact Peg Hudock at 215-518-3661 or Ruth Ann Barndt at 267-772-9500. Nearly 100 members and friends of St. John’s came together May 29 to celebrate the marriage in April of our pastor, the Rev. Axel Kaegler, to the Rev. Karen Sease, pastor at Grace Lutheran Church in Pottstown. The reception in the church’s multi-purpose room, decorated with handcrafted hanging doily lights and table lanterns and flowers, was highlighted by a potluck dinner, music which prompted a dance by the newlyweds, cutting of a three-tiered wedding cake, and presentations to the couple. Special guest at the event was Pastor Kaegler’s mother, Kari Kaegler of Upper Saddle River, N.J.
Church member Mildred Westgate, who has been married to her husband, Chester, for 68 years, offered good-humored advice to the couple, and others in attendance wrote their words of wisdom on index cards which were presented to the bride and groom. Also presented from the congregation were a monetary gift, a stained glass star handcrafted by members Loretta and Doug Thorson, and tee-shirts for challenging times that read, “Don’t give up…Moses was once a basket case.” The Willing Workers, St. John’s service group which hosted the reception, gave Mrs. Kaegler a garden totem made by its members. Warming casseroles, ham, brewing coffee and the smell of baked goods wafted from the church kitchen into the adjacent multi-purpose room on Father’s Day, June 21, blending with the music and prayers of the morning when wet conditions in the grove brought the service inside. coffee. Thanks to everyone who prepared the food and baked goods, set up, served, and cleaned up. Father’s Day was to be the first outdoor service for the summer in the grove across the road from the church. Services will be held outdoors, barring inclement weather or wet ground, through Labor Day weekend. The “Willing Workers,” St. John’s new service group, won’t be taking the summer off. Meetings are scheduled for Aug. 7 and 21 at 9 a.m. at the church, and July 28 the group will take a trip to Lancaster County for shopping and lunch. Participants will meet in the church parking lot at 9 a.m. to form a carpool. At the Aug. 21 meeting, the “Willing Workers” will roll up its collective sleeves and roll out pounds of dough for a “trial run” on making apple dumplings. If all goes well, an apple dumpling sale could be in the offing. Those joining the effort are asked to bring their favorite apple peeling devices, roll out sheets, jelly roll cookie sheets, apple corers, rolling pins, aprons and pizza cutters. The “Willing Workers” selected officers at its June 19 meeting: Peggy Hudock and Ruth Ann Barndt, co-chairs; Nina Helm, treasurer; and Kathie Sensinger, secretary. The group continues to sell its handcrafted grapevine creations and lawn/garden art, most recently at a craft/flea market at St. Isidore’s church in Quakertown. It will continue to work on craft items for the winter season. The Willing Workers is eager to grow its ranks. New members and new ideas are welcome. For additional information about the group and its projects, contact Peggy Hudock at 215-518-3661/pjhudock@gmail.com or Ruth Ann Barndt, 267-772-9500/ruthybarndt@verizon.net. Check the "PHOTOS" section for more photos! Pastor Axel Kaegler enjoys a soft pretzel at the church picnic, as well as the company of church members Erna Doerr, left, and Mary Hoff. Sarah Smith and her brother, Zac, offer a blueberry cake to John Sigmans after Sarah won a cake and Zac won three in a row during the church picnic “cake walk.” The children said they knew Mr. Sigmans was hoping to win a blueberry cake in the walk, so they offered him their last “win.” It was the second blueberry cake for the duo that day. The bluegrass group “Without a Paddle,” was the main attraction at the Church Picnic and Bluegrass Concert, held in the grove across the street from the church. SUPPLYING SUPPLIES…Rebecca Hinderliter, right, president of the church council at St. John’s Lutheran Church of Spinnerstown, presents supplies the congregation collected for students at Pfaff Elementary School in Milford Township who may need help purchasing the required items. St. John’s, the oldest Lutheran church in Bucks County, is the school’s neighbor on Sleepy Hollow Road. With Hinderliter, preparing for the start of the school year, are Barb Chadwick, school secretary, and K. Eric Thompson, Pfaff’s new principal.